Mosquito yard control methods include both natural and chemical treatment. Homeowners, who are aware of pros and cons of non-organic insecticides, tend to apply eco-friendly bio-pesticides, which are less hazardous to pets, humans and plants. 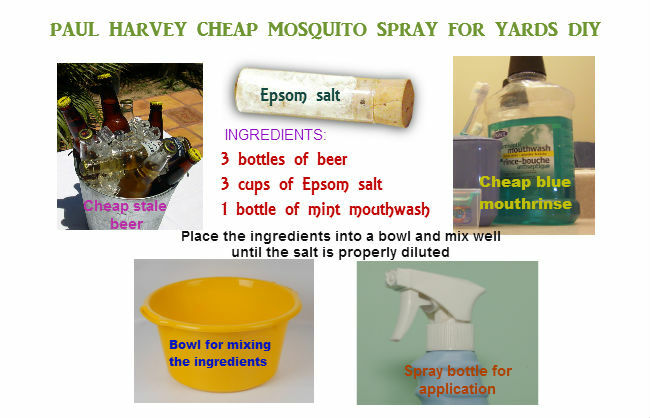 To mix homemade mosquito yard spray is a cheap and effective way to get rid of mosquitoes around home. The active ingredients in natural mosquito spray for yard diy can be extracted oils and vegetables, such as garlic and onion. Homemade pest control products kill mosquitoes on contact and create an invisible barrier that these annoying insects won’t penetrate for a week up to three months. Application of homemade mosquito yard spray is as good as professional yard treatments. Though, due to that mosquito outdoor products diy don’t contain any preservatives, they have a shorter “shelf life” to compare with professional pest control methods. Homemade backyard sprays should be applied regularly during the mosquito season. This recipe of Paul Harvey has been used for about 20 years by the most homeowners in the USA. It really works. Homemade mosquito yard spray is intended for outdoor application and keeps mosquitoes away for about 2-3 months. Not only mosquitoes, but also other bugs and insects keep off the yard and stay away from home as well. It is amazing, they just avoid areas treated with the stuff. Moreover, it has a nice mint smell, that doesn’t deter humans. Just mix and spray, than enjoy sitting on the air at night without mosquitoes’ annoying sounds and attacks. This anti mosquito spray for yards, lawns and gardens has been used for ages. You are likely to have heard about this stuff from your granny. This spray is applied outdoors to keep mosquitoes off for about a month. 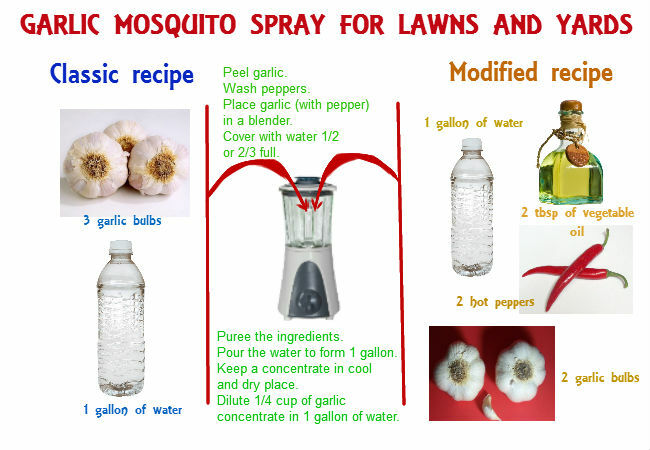 Homemade mosquito yard spray with garlic is an old recipe that has been used for ages. I have heard about this repellant from my granny. This spray is applied outdoors in lawns, yards and gardens to keep mosquitoes off for about three hours – a week. Though, it has three drawbacks: the garlic disgusting smell, regular reapplication and high toxicity to cats. As it has been mentioned above, mosquitoes avoid the scent that is given off by plants such as basil, geranium, citronella grass, catmint and catnip, lavender, clove, mint, spearmint, lemon grass and eucalyptus. The smell of oils, that are extracted from these flowers, deters blood-feeding insects, protects from their bites and control mosquito attacks. For organic mosquito control you can use outdoor mosquito repellent spray diy with essential oils. This natural treatment is safe to pets, animals, plants and children. For natural mosquito repellent treatment you can use a homemade spray with essential oil of lavender (or any other oil that is mosquito repellant). It is safe to pets, vegetable plants, pregnant women and children. Organic anti mosquito spray acts as a biological barrier and keeps blood-feeding females away to prevent vector-borne bites and control mosquito infestation. I tried the mouthwash recipe and the garlic spray and both were completely useless. The lavender and peppermint concoction sometimes works. The mouthwash recipe is useless! Will the paul harvey recipe harm plants near porch? I sprayed cautiously when I first sprayed this mixture. I’m glad I did as the weeds I sprayed wilted and curled up, but did not die. Also the edge of my hydrangeas developed orange spots where they were sprayed. The grass seemed okay. I think there is too much Epsom salt. I haven’t continued to us it. Also seemed to damage my raspberries where they got sprayed. No I use it every year. It lasts about 6 months for us. Both Epson salt and beer are known to be good for plants. Will this hurt the honey bees? I have a hive in my yard. All of the “flowers” came off of my pepper plants, I didn’t spray the plants on purpose. It also left a film on my deck. Garlic is toxic to cats because their livers can’t process it. Just like onion and many essential oils. None of these are cat safe actually. I used the cheap beer, cheap blue mouthwash and Epsom Salt last year, and it worked wonderfully! Mixed it up, put it in a yard sprayer. It does not actually KILL the mosquitoes or other bugs, but they do leave after several days…meanwhile, they fly around… I think they know you’re there, but the smell confuses them. Its really kinda funny. But, good news is its cheap, doesn’t hurt the grass or flowers or you or your pets. I got a 6 pack of really, really cheap beer and a big bag of Epsom salt…next time I’m at Walmart or Costco I’ll pick up the mouth wash, and I’ll be set if summer lasts more than 3 months, and in GA it very well might! Hey Valerie, how big of an area will one recipe mixture cover? I am trying this, but I cant get the salt to dissolve! it has all been soaking in the sprayer bucket for 24hrs. What is the trick? In order for Epsom Salts to dissolve properly it must be stirred or agitated in some form or another so it won’t clog up sprayers etc. Once you’re finished it must be washed out completely, because when it dries and it hasn’t been cleaned out properly, you will have salt crystals in your system which will plug up your sprayer during your next application. Helpful tip. On the thorough clean up. I used heat to quickly dissolve the salt in the beer/mouth wash solution. I put the beer in a pot and just warmed it on level 2. and put the Epsom salt in and stirred. it didn’t take that long doing this way. Hi Valerie, so can you tell me if you have to re-spray the grass areas after you water the lawn? I water a couple or 3 times a week and would hate to do this after every watering! And can it be sprayed on the siding of my house with out damage? Tried the beer, mouthwash & epsom salt mosquito spray. I used $Store mouthwash, not the blue variety. It worked!! Sprayed the yard in the morning, while the little buggers bit me like crazy! I went to work in the yard in the afternoon, mosquito free. I was skeptical, but the mosquitoes are so bad in SW Florida this summer, so I was ready to try anything! So glad I did. This is a keeper. I sprayed back in May and haven’t had any trouble wth mosquitoes since I got bit by one this evening while on the porch, time to spray again. How often do you have to mix a batch of mixture of the beer, mouthwash and Epsom salt to keep the nasty pests away? So you need to reapply after rain? The guy at the store told me I needed the hose sprayer attachment…doesn’t that water down the solution? Is it still effective? If it keeps ALL insects away, would you want to use it in a vegetable garden? It sounds like it would keep pollinators away, too. The Epsom salt does take a LONG time to dissolve. It clogged my 2 gallon sprayer with the first batch my husband made. I just made a second small batch and had to stir for quit some time. That should be in the directions. I just did a sample spray on the railing of my deck about 1 1/2 hours ago and just checked again. It darkened my wood !! Now maybe later on it will dry further and the stain will fade, but right now I’m not doing any more till I know it won’t stain. Respectfully if you do your homework correctly and search deep enough into the use of Citronella as a repellant, you too will discover that it is truly worthless as a repellant. The commercial Citronella oil actually comes from a tall grass and NOT the plants so many of us have duped into buying at our local Diy store. I have in the past used a blend of 99.3% pure garlic juice, water and vegetable oil and sprayed my entire farm with it and it did work as it eliminated the mosquitos, flies, gnats, bats and deer. The application lasted for approximately 30-45 days depending on the weather we experienced here in the N. Georgia area. Good Luck in your continued quest for the perfect skeeter repellant. How much oil did you use. Buck, can you give portions of each to mix please? Please I also would like it. What is the recipe for the beer, Epsom salt, listerine spray. Heat up the beer then place the epsom salt in to dissolve. Will the solution stain patio furnitures and cusions? They’re supposed to be weather proof but I don’t want to stain them and leave marks…anyone can advise? 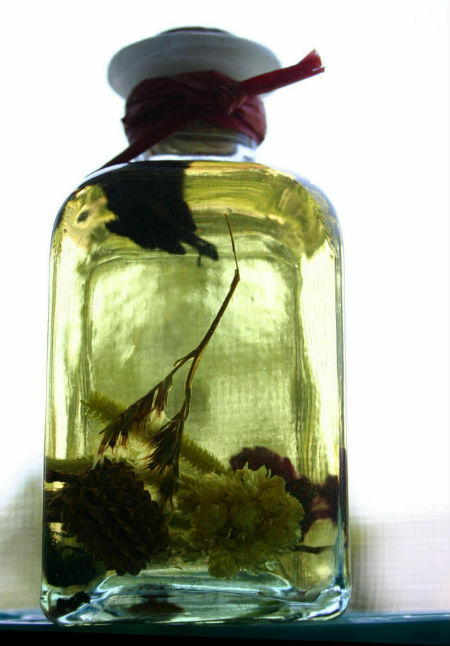 Thanks Karen – many incredible ideas – I keep forgetting about how good neem oil products are. I added this to the pinned posting. Can I use non-alcohol beer? Can I use non-alcohol beer? What about using tea tree oil. Would that work? This is for the homemade yard spray. Is it safe for bunnies and birds and others? Thanks Lisa! If the mouthwash mixture worked for you with aggressive mosquitoes, it should work at my cabin on northern Michigan. I was just up there memorial weekend and we couldn’t even sit by the campfire without getting eaten alive. they were even coming into my barn to get me. I am also looking for the garlic recipe. A local near my cabin will spray a garlic/ dish soap concoction for $85 per 1/2 acre. i want to make my own. I heard he uses a leaf blower to spread it. I live in your area too – did you notice if the spray stains anything such as wood, or fabrics on cushions etc.? Just mixing up my 1st batch to spray in a bit and hoping this gives us back our summer evenings outside. 2 garlic bulbs broken into cloves and peeled and 2 jalapeño or habanero peppers Blend in batches using 1gal water. Strain, add 2 Tb oil storing in 1 gal container. This is the concentrate. Use diluted only mixing 1/4 cup to a gal of water. I’m going to try this. It sounds promising. How big a bottle of mouthwash do you use? I used it and wow it worked !But the next batch I added 1 cup warm water with the beer and salt and mixed it together first. This helped with disolving the salt,then added the mouthwash. It worked better when I mixed it all together that way. It’s so much better for the environment! ! I was wondering is adding veg. Oil to the Epsom salt, listerine and beer batch would make it last longer in heavy rain? I live in subtropical region, central Florida and we have plenty of pest. Thank you for sharing the recipe..
Is there a homemade mosquito repellent recipe that won’t kill or drive away the beneficial bugs, like ladybugs, bees, butterflies? I am a horticulturist. Over the years I have tried any things. I think that somewhere along the way a step was left out of this. So I am gonna share with you the experience that I had today with this. Just doing a trial and error thing. If you have ever heard of Jerry Baker the horticulturist he recommends home made teas/brews for the garden and they are great. Look him up if you garden. So to get on with what I started here. I made the tea (beer, mouthwash and Epson salts). So to use just the basic mix if you have a large yard would be expensive. So I tried 1 cup of mix with 3 cups of water in a household in a square alcohol(rubbing) bottle. It works great. When I first started spraying the mosquitos went crazy and were attacking me. So wear long clothes. But I gave it about 30 minutes and they were gone. And other yards bugs started moving around also. It has been about 6 hours and still no mosquitos. I couldn’t find my hose end sprayer. But as soon as I do I am going to try to fill it with mix and then spray my entire yard. Will post results when I try it. I put the spray down about 2 weeks ago but am still having trouble with mosquitos. I just put down another application. Hopefully this one works. Anyone else have to put down another application? Tried the Paul Harvey mix. Completely useless! don’t waste your time and drink the cheap beer instead! Buck can you give the recipe portions of your garlic mixture please. It sounds like a winner. Thank you. Living the dream along the Mississippi river in Iowa. i will say i got an extra half hour outside but even with putting the concoction on myself the little bloodsuckers still came after me.it was 90f here i hadnt showered yet after work and had a few beers so that may have contributed to it.it smells nice in my yard so it might be subjective. Does anyone have the answer about whether this will also repel honey bees? I tried the beer, mouthwash, Epsom salt mixture. The first application left a white reside all over everything when it dried, so I quickly rinsed if off to prevent any possible staining. I tried again after lettin the mixture sit for a few weeks, then shaking the container vigorously to mix. Same white residue on everything that was sprayed. Since there is no mention of a white residue in any of the comments wondering if I am doing something incorrectly. Can I make a candle wax floor polish that repellent mosquuitos more than a week? Would any of these deter skunks looking for grubs? I tired the Dave Harvey mixture here in Phoenix. It had no effect on the mosquitos! My 8yo son thinks it attracts rather than repels them. We seem to have the Asian Tiger variety which is very aggressive. I completely dissolved the salt (3 cups), Walmart mint mouthwash (50oz) and 3 beers (really stale). Applied it to both the front and back patio areas – on the walls, bushes and anything else that I thought the mosquitoes would possibly land on.